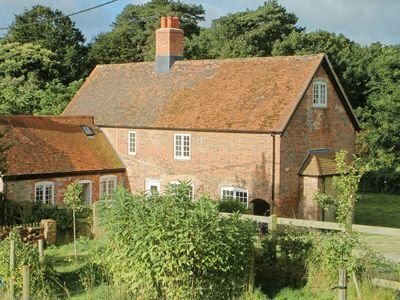 If you've been casting your eye about looking for a large holiday cottage to take a holiday with friends and family, and, furthermore, you're looking to take a break on the Isle of Wight, you may well be interested in "Whitecroft Farmhouse". Whitecroft Farmhouse can be found just outside Newport, and sleeps 11 people in 5 bedrooms - so this holiday cottage is a good size for a get-together. The bedrooms at Whitecroft Farmhouse are made up of 3 doubles and 2 twin bedrooms. With one of the twin bedrooms having an additional single bed. Whitecroft Farmhouse is a 17th century farmhouse, and still has lots of olde worlde charm going for it: there are a couple of inglenook fireplaces, each with its own wood burning stove. You also have a beamed kitchen with an Aga. it's not all 17th century rustic charm at Whitecroft Farmhouse though, you do get plenty of 21st century mod-cons. There is central heating, so you don't need to rely on the fireplaces to provide all the warmth. You have a couple of TVs and DVD players. A CD player, radio and iPod dock are included; you even have Wi-Fi at Whitecroft Farmhouse. A washing machine and dish washer are also provided. All your towels and bed linen are included in the price of your holiday. There is a large garden at Whitecroft Farmhouse - ½ acre to be precise. With lawn, a terrace and a decked area. There is also parking for 3 cars. The grounds at Whitecroft Farmhouse - plenty of room! Should you want to leave the farmhouse and explore Isle of Wight, you'll find the central location of Whitecroft Farmhouse makes all corners of the island easily accessible. With Ryde, Cowes, Yarmouth, and Old Shanklin all being well worth a visit. There are a range of attraction to visit: Ventnor Botanical Gardens, Pearl Centre, Dinosaur Museum, Donkey Sanctuary and Calbourne Water Mill are all worth a look. With Blackgang Chine being worth a visit if you have children as part of your holiday. There is some nice, scenic, walking to be had. Or try horse riding, fishing, cycling, water sports and golf. Holidays at Whitecroft Farmhouse start on a Friday. You can also rent Whitecroft Farmhouse for a short break, so you can enjoy a weekend away. Should Whitecroft Farmhouse not be to your liking, but you fancy staying in the area around Isle of Wight, you might well be interested in the cottages below. All these cottages are within a few miles of Whitecroft Farmhouse.